Started its operation in the year 2013, Maya Aromatics is appreciated and knowledge among its customers for manufacturing, wholesaling and supplying the finest quality of Honey Products. Consists of Honey Bee Products, Eucalyptus Honey and Litchi Honey, we offer a wide range of honey products. The superior grade honey is used for processing the offered honey products in compliance with the food set norms and regulations. The offered honey products are quality tested before being dispatch at the customers’ end. Owing to their rich taste, natural colors & flavor, purity and enhanced shelf life, these honey products are highly demanded in the market. Rendered by us at cost effective and affordable prices, the offered honey products are highly appreciated among our customers. By meeting the bulk demands, we have been able to cater to the precise needs and expectation of our valuable customers. We accept different modes of payment such as cash, online and credit cards, keeping the ease, budget constraint and convenience of our valuable customers. These honey products are packed with standardized packaging before dispatch, to ensure safe transportation at the customers’ end. Moreover, we assure delivery of the offered honey products within the assured time frame, owing to our strong logistic support and wide distribution network. We were set up as a proprietorship and are operated under the supervision of our mentors, Mr. Hariom Singh and Mr. Jai Prakash Sexena. Financial stability and goodwill are attained owing to in-depth knowledge and years of experienced of this domain. 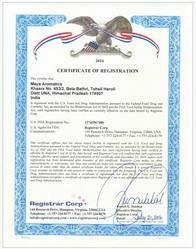 Manufacturing and Trading of Honey Products. We have been able to attain a commendable position in this domain, by providing our customers with the food grade honey products at cost effective prices. All the honey products are quality testing at our state-of-the-art in-house quality testing unit, before dispatched at the customers’ end, to ensure high standards of quality. In-house quality testing unit coupled unit coupled with one of the most experienced quality controllers of this domain, has helped us in providing our customers with the unmatched quality honey products. Owing to our quality control policy, we have earned the trust and confidence of our valued customers spread across the globe. Owing to our quality control policy, we have earned the trust and confidence of our valued customers spread across the globe. We have been supported and backed by advanced, sophisticated and ultra-modern infrastructural facility, which is appreciated among our customers for its large production capacity. Spread over a wide area of land, our infrastructure is carefully divided into different units, to ensure that all the on-going processes are carried out in the most efficient and streamlined manner. Backed and supported by a team of experienced and dedicated professionals, we have been able to attain a commendable position in this domain. Our team of skilled and semi-skilled professionals is trained at regular intervals, to upgrade them with latest happening and development of this domain. 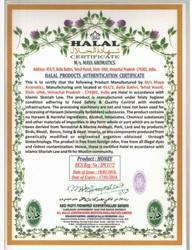 HALAL CERTIFICATE of Maya Aromatics. 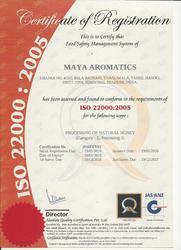 USFDA CERTIFICATE of Maya Aromatics.